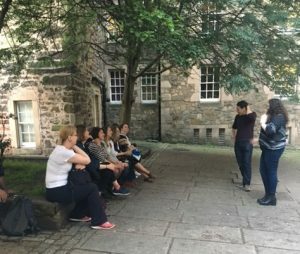 To round off a very busy Thursday, packed with innovation fund project talks, musical instruments, a peek behind the scenes of the St Cecilia’s Hall redevelopment project and a lovely afternoon at the Botanic gardens, we made our way to the Grassmarket for the Edinburgh Literary Pub Tour. We took our seats in the Beehive Inn not quite sure what to expect. 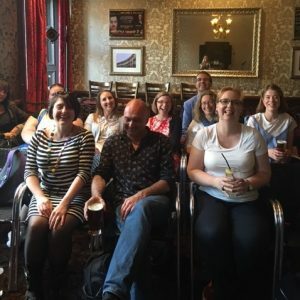 The tour takes you on an amusing literary journey to a handful of Edinburgh’s better informed pubs. Our hosts were Clart and McBrain who question the importance of the pub in influencing the writing of some of Scotland’s great literary figures. They also taught us a thing or two about Edinburgh’s literary past along the way – although we may have proved a tough audience in this regard. An entertaining evening was had and we even managed to squeeze in some outreach work. The Centre for Research Collections can possibly expect to be issuing a couple of reader’s cards to Clart and McBrain in the future!